UPS Unveils New Electric Trucks That Look Straight out of a Cartoon - The Maghreb Times ! UPS has shown off the new look of its electric trucks. The lightweight trucks will be tested in major European cities before the end of the year. UPS has unveiled new electric truck and it looks too cute to work. The new fleet of 35 lightweight trucks has a rounded retro-futuristic look that many are comparing to the animation studio, Pixar’s aesthetic. UPS said they are working with vehicle manufacturer ARRIVAL on the pilot fleet of electric trucks that have a range of 150 miles on a single charge. UPS will test the trucks in Paris and London before the end of the year. The high tech trucks feature a “highly advanced vehicle display,” and a wrap-around windshield that gives drivers a wide view of the road. Embedded Advanced Driver Assistance Systems aim to reduce driver fatigue. “UPS is marshaling its global scale to encourage innovation within the automotive industry. We are helping to drive demand for these disruptive technologies. The result is a safer and cleaner fleet for the communities in which we deliver.” UPS have been collaborating with ARRIVAL since 2016 and the trucks have gone through several iterations and design developments before getting to this final stage. UPS’s relationship with electric vehicles stretches back to the 1930’s and continues strongly today. 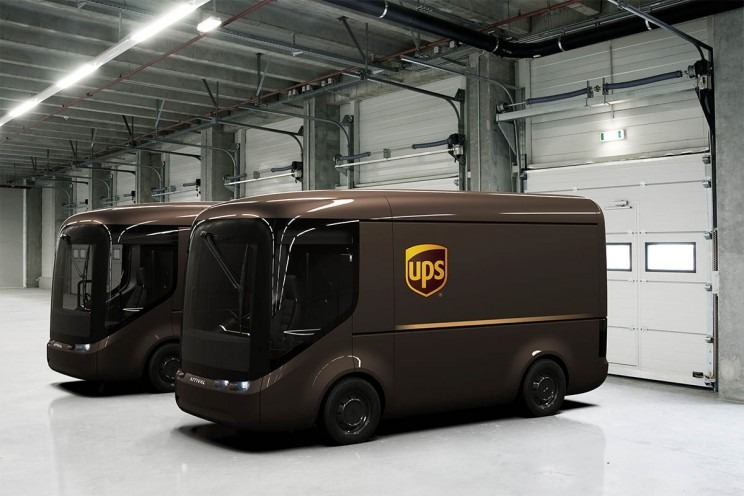 UPS currently has more than 300 electric vehicles deployed in Europe and the U.S., and nearly 700 hybrid electric vehicles. UPS has also been among the first big-name clients to sign on to the Tesla semi. UPS have ordered 125 trucks from Tesla creating the largest pre-order so far. In 2016 UPS achieved its goal of achieving covering 1 billion miles (1.6 billion kilometers) using its fleet of alternative fuel and advanced technology vehicles. The milestone was passed a full one year before the intended date.